Nearly a year after the NBC Bay Area exposed restaurants on the peninsular skirting inspection reporting requirements, the county's civil grand jury is calling for more enforcement and a window placarding program. Better information for customers and more enforcement is needed for San Mateo County restaurants, according to a new report from the county's civil grand jury, which is now calling for window placards denoting inspection scores to be posted in restaurants. The grand jury report cites an NBC Bay Area investigation last year which exposed restaurants on the Peninsula and in San Francisco skirting laws requiring their most recent inspection reports be posted. 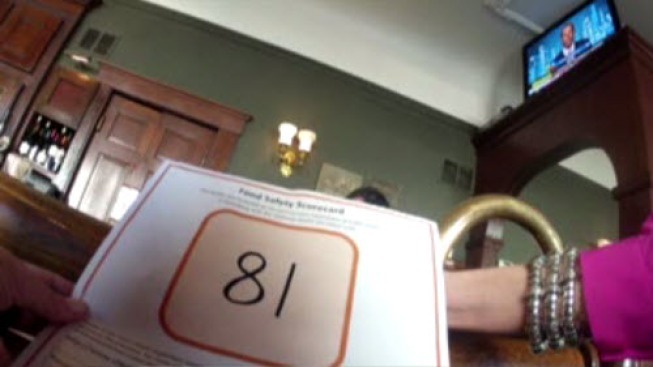 A restaurant scoring system was passed earlier this month in Santa Clara County, after another NBC Bay Area undercover report exposed a disorganized and unclear restaurant inspection system in the South Bay. The San Mateo County grand jury found inaccurate and incomplete inspection information posted on the county's website. The grand jury recommends developing a program that would require restaurants display inspection results with window placards and assess fines if it is not posted. Currently, San Mateo County restaurants are required to post the most recent inspection report which shows how the restaurant scored (from excellent to poor) and displays major health violations. In the NBC Bay Area undercover investigation last year, the team visited 25 San Mateo County restuaurants with hidden cameras and only one had the current report displayed. "We’re very pleased that the Grand Jury acknowledged the inspection process that’s now in place in San Mateo County”, said Heather Forshey, Environmental Health Services director. "We agree that the website needs improvement and have been working on the inspection report content in addition to online delivery of inspection reports," she said. "We are now in the process of rolling out new software and field laptops to inspection staff for quick uploads to the website." According to the Department of Environmental Health, the county is currently reviewing the feasibility of a restaurant placarding program. The Board of Supervisors has until August 19 to respond to the recommendations.